Our Licensed Massage Therapists are highly trained specialists skilled at a variety of techniques. From our Grand Massage to our Specialty Massages, at the Grand Beauty Spa, we have the perfect Tampa massage for you. Please enjoy our elegant and beautifully appointed spa facility including our infrared sauna, steam room, and relaxation areas as part of your experience. 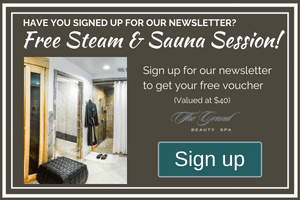 Make it a day at The Grand! Indulge in a full day of pampering. Order a Spa Lunch, relax and enjoy your European Day Spa experience! Enjoy your choice of a massage or facial every month plus discounts on salon treatments and our retail boutique , plus unlimited use of our water therapies with one of our Grand Membership choices! Keep yourself looking good, feeling centered and rejuvenated. The receptionist had made an error by putting me down for a couples massage, but Bruce and Kim were very accommodating and gave me the service I had initially requested. The mud bath was refreshing and the lotion application afterwards was wonderful. Bruce and Kim were both great. I would definitely recommend this spa! They have everything and are so professional. I went for the Grand Massage last week, which was 80-minutes of pure bliss. The facility is beautiful, and truly a gem here in South Tampa. I love their relaxation areas, and the staff is helpful, warm and polite. I had Keri, one of the newer massage therapists and she was delightful! I’m usually pretty picky about massage therapists and she was one of the BEST I’ve ever experienced. She was able to help me find a solution to my never ending back pain. Love this place and will be back again to make use out of the luxurious couples massage room!